Web Design - dlfWebgroup, Inc.
dlfWebgroup Inc., a Boston area web design company, prides ourselves on offering great looking sites that really “sell”, whether it be you, your product or your services. After a final version of the design is derived, web pages are constructed. As each page is built, it is put in a “test file” for the client to view. Changes can be easily made at that point. Ease of navigation is a major component of all sites. We have a simple rule that you should be able to go anywhere in the site from anywhere in the site. Each page of your site will feature multiple ways to navigate throughout the site. We offer no-obligation, complimentary consultations designed to analyze your existing site (or potential Web project) and your Web marketing strategies. Real help, not a disguised sales pitch. An impressive list of satisfied clients will be glad to speak as references for our company. Responsive Web Design, What’s It All About? A responsive website would give your users an optimal experience while browsing through your products and services through different mobile devices without the glitches of zooming and pinching. A Responsive Website is a site which has a flexible layout that detects the visitor’s screen size and orientation and changes the layout accordingly. It’s a site, which is contextual to the size of the screen, so that a user doesn’t have to scour the length and breadth of the website to find what he is looking for. Responsive sites can be designed to make the text on the page larger and easier to read on smaller screens. They can also be configured to make the buttons on the phone’s screen easier to press. It can prove quite troublesome and expensive to maintain and market different websites for different platforms. 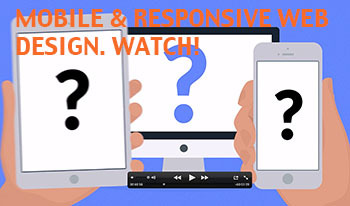 A Responsive Website removes you from the trouble of doing this by working on every platform. Is It Time To Rebuild? If it has been more than 2 years since you refreshed your website, it’s time to start thinking about an overhaul. Content Management Systems are much more robust than they were several years ago, and provide many new features for you and your users. Content Management Systems also empower you to make changes to the site’s content without extensive knowledge of HTML. In addition, some older features are becoming outdated. If your current site still uses “Flash programming” you are in trouble. Many phones don’t currently support it, meaning that customers won’t be able to see your content. Adobe, the manufacturer of the Flash platform just laid off 750 employees and is shuttering one of their divisions responsible for the development of Flash for mobile devices.